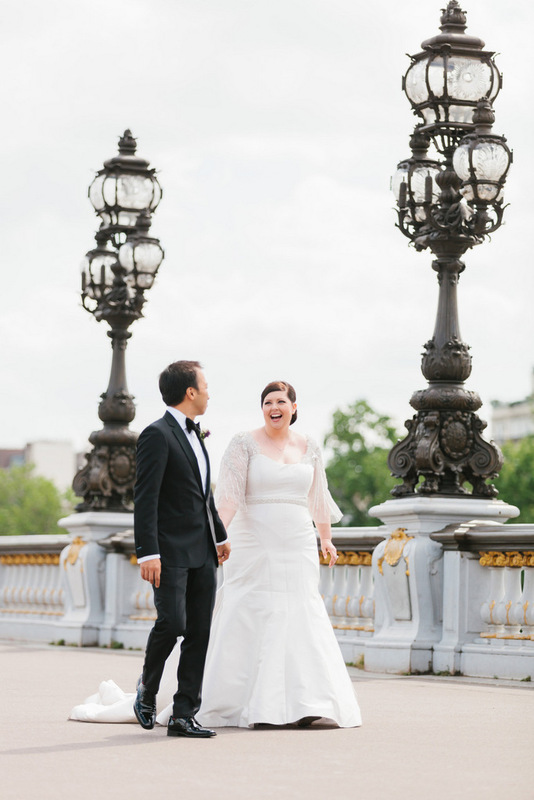 These two love birds got married during a gorgeous wedding in Paris and it was amazing! 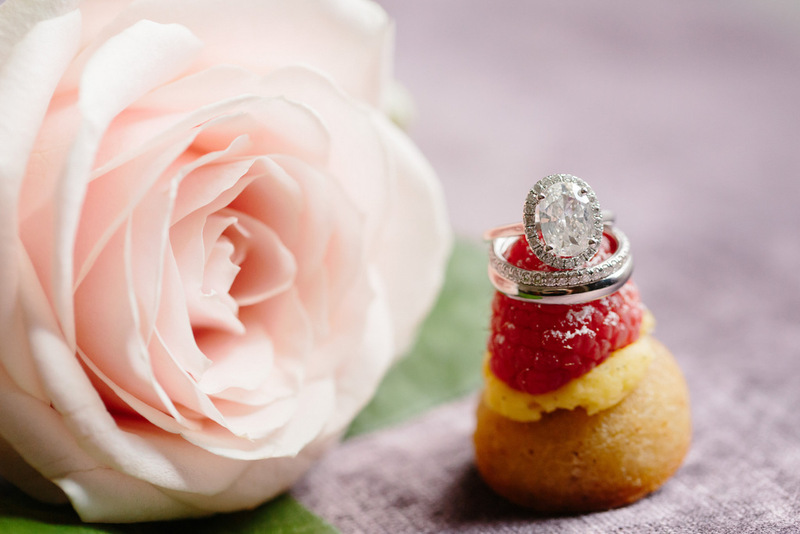 Including a food tour, a rehearsal dinner on a cruise and sharing a champagne toast after the ceremony with their mothers, a French tradition. Check out more in our winter issue below. 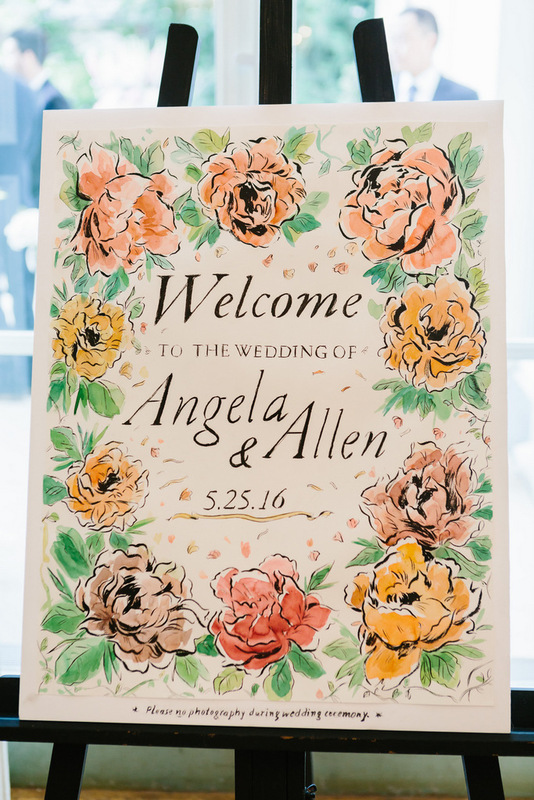 Tell us about your wedding: “Allen is from the East Coast, and I’m from the West and we could not decide where to have a large wedding in the US. 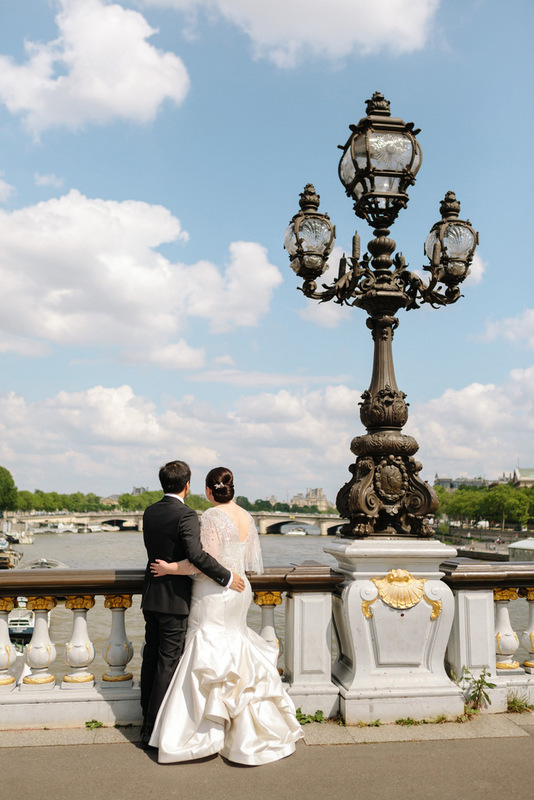 What we did know was that we wanted to honeymoon in Paris and the Amalfi Coast, so since we’d be flying there anyways, why not just get married in Paris?! 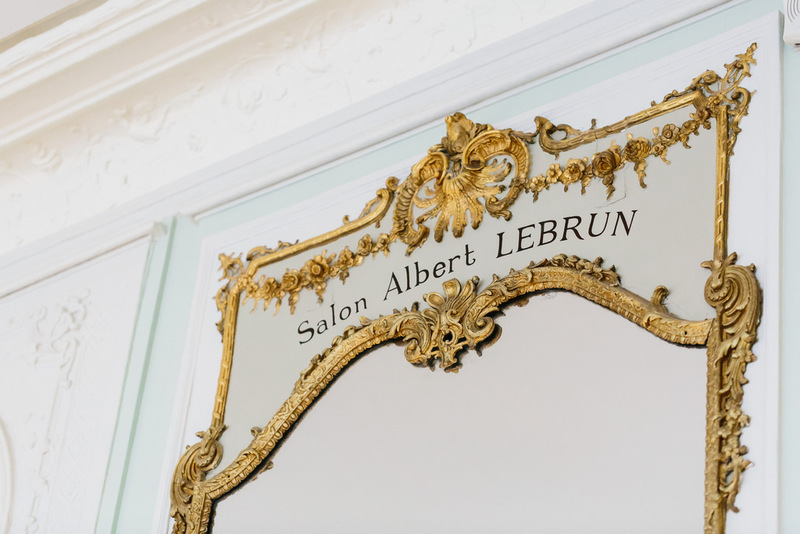 We slashed our guest list from 200 people to 20 people and created a glamorous, intimate affair in the City of Lights. My dress search took me from LA to NYC. I wanted 2 things out of my dress – something that showed off my curves, and something that covered my arms. It’s so hard to find a plus-size dress with sleeves and when you do, it’s typically lace, which isn’t my style. I saw on the Pretty Pear Bride Instagram a photo of a model wearing the Carol Hannah Polaris wrap, so I went to the Carol Hannah studio to check it out. I loved the wrap, but it still didn’t cover my arms enough, and I had no idea what dress would go with it. I worked with the designer there to create a custom gown, turning Polaris wraps into a capelet with sleeves, and attaching it to their Tourmaline gown, which we altered the seaming on to accommodate a belt. The result was glamorous, unique, and totally my style! I felt stunning in it. 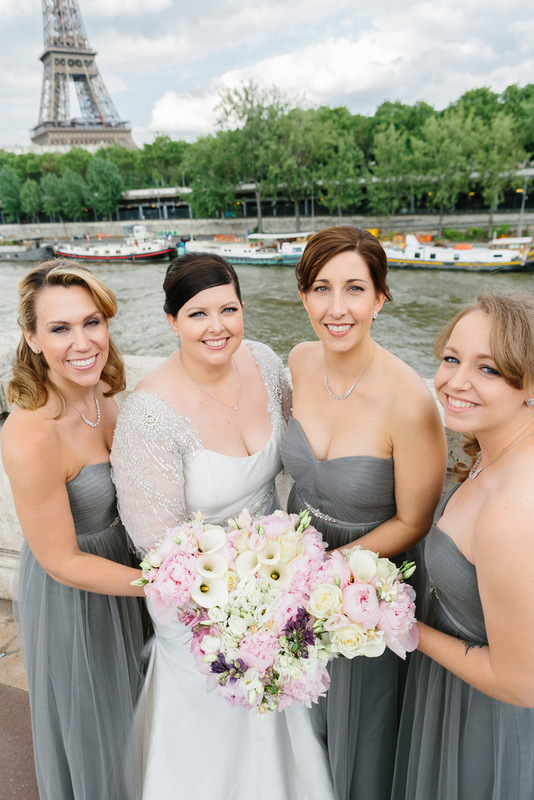 Because it was such a small group of guests and we wanted everyone to enjoy that we’d all traveled to France, we did some special things – instead of a traditional rehearsal dinner, we had lunch aboard a cruise on the river Seine for everyone to see the sights. We also arranged a food tour around the city for all the ladies, where we explored different neighborhoods and indulged in amazing baked goods and chocolates. 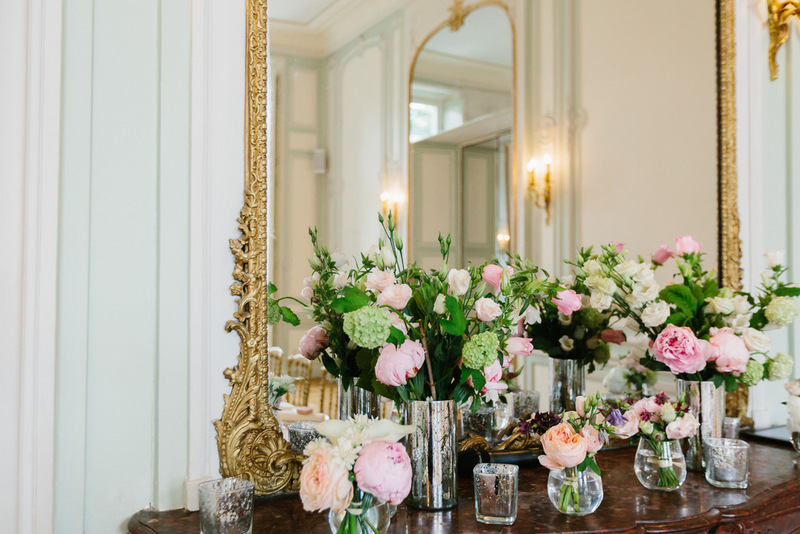 We also participated in a French tradition of sharing a champagne toast with our mothers at the end of the ceremony – they drink from their glasses, then pour them into a glass that Allen and I sipped. We had our ceremony and reception in the same location – Masion de Polytechnicians. 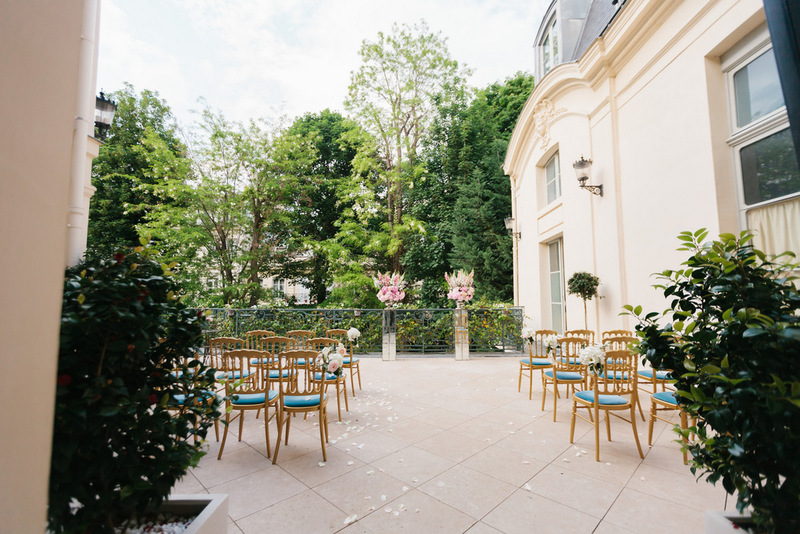 It’s a private mansion with different salons that allowed us to be married outdoors on the terrace, have cocktails in one salon and dinner in another, and then dancing in the wine cellar below. How did the two of you meet? Allen and I met online in NYC when I was there for 3 months for work. I thought it would just be a summer fling, but we continued a long-distance relationship for a year and a half until Allen moved to LA to be with me. Describe your engagement: Allen and I were visiting NYC and went out to dinner with friends. I asked what we were doing after dinner and one of our friends worked at a restaurant called The Dutch, so Allen said we were going there for wine and pie. When we arrived, Allen took me downstairs and led me to a private room that had been covered with candles. He got down on one knee and I have no idea what he actually said because I was too busy crying. But I said yes and there was fabulous champagne and a stunning 2ct oval diamond ring and we celebrated with our friends the rest of the evening. 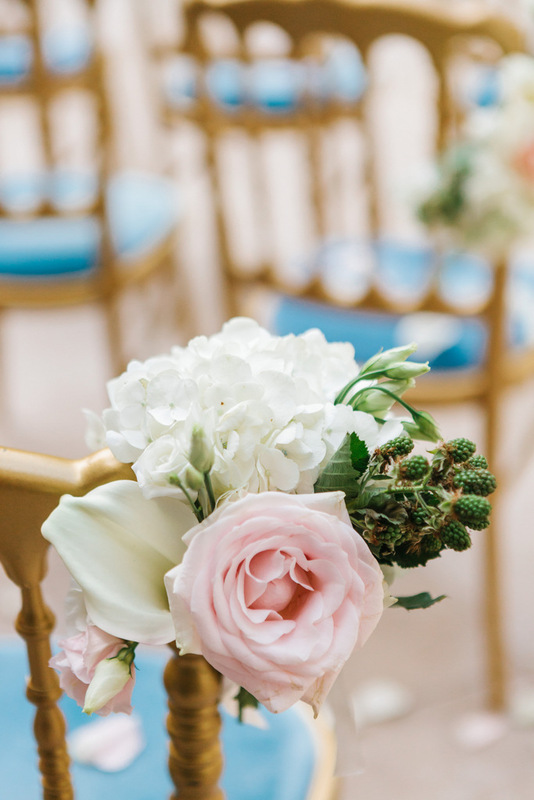 Personal or handmade details: I carried a brooch from my grandmother, and a Celtic cross from my nana, attached to my bouquet as my something old. My something new was our wedding date stitched into the hem of my dress in blue thread. We also created a slideshow of photos of Allen and I that included photos of us with our guests over the years that played during cocktail hour. 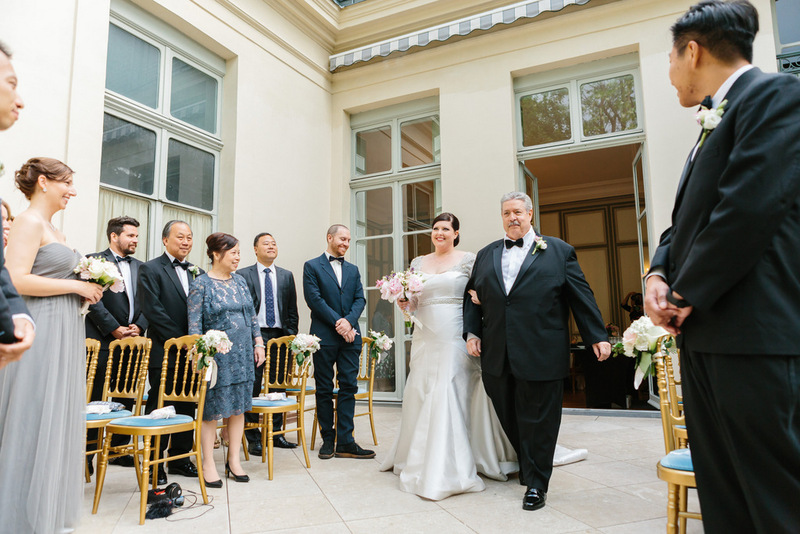 It began with a clip from “An American in Paris” with Gene Kelly singing “Our Love is Here to Stay.” The song from the slideshow seamlessly transitioned into the Frank Sinatra version and began our first dance. 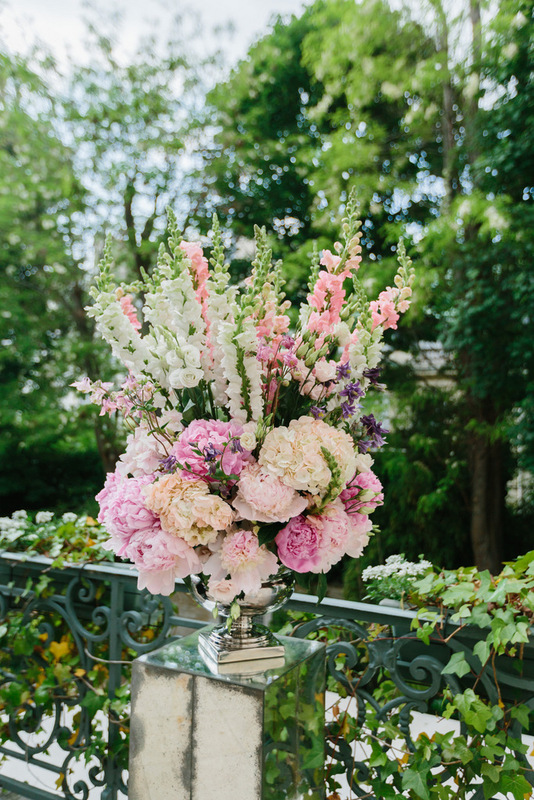 Describe your flowers: The flowers were outstanding, done by Sol y Flor. I requested hydrangeas and peonies in pinks and some purple for accent and the finished product was more beautiful than I could’ve imagined. 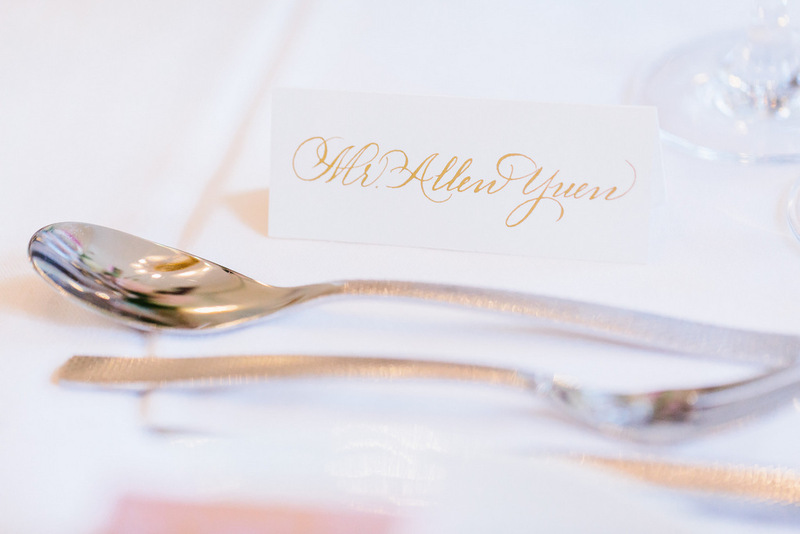 Memories and Stories about the Day: “During the ceremony, we wanted to include a moment that got all the guests involved, so we wrote the story of how Allen and I met with fill in the blanks. We left the answers to the each of the blanks on the guests’ chairs. As our celebrant read our story, when he came to a blank, he’d call out a number, and the guest with that number would yell out the answer. The thing that we would have done differently is? In France, its not traditional to do a rehearsal like we do in the US. I wish we’d had one, as they played the wrong song for the recessional, and the celebrant mispronounced some important names. I also wish we’d left more time for photos so I could’ve done shots of myself with individual guests. 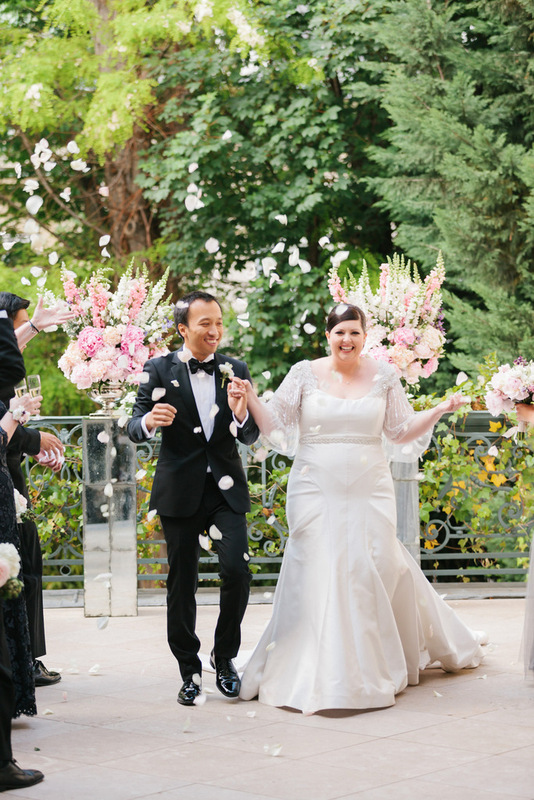 Your advice for other plus size brides: Don’t give up and don’t be afraid to think outside the box when it comes to finding your dress! The dress sets the tone for the event style-wise and should make you feel like royalty on your big day. Don’t settle for anything less. 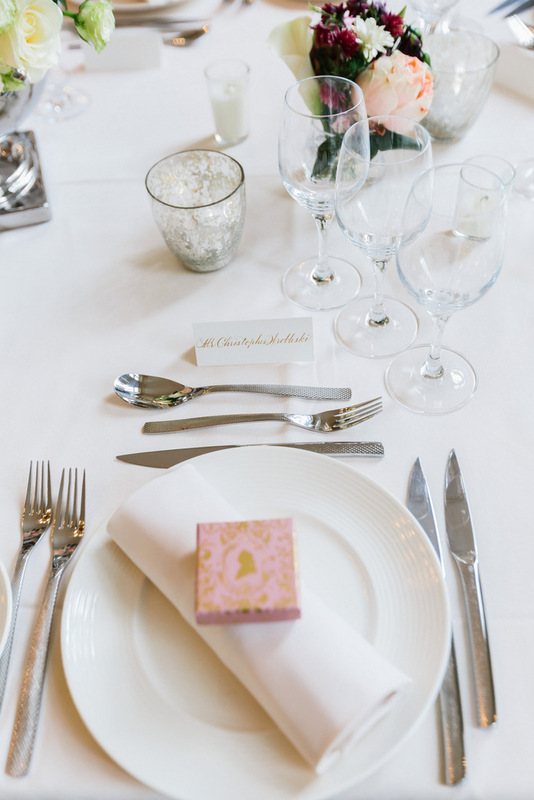 Three adjectives that describe the day: Glamorous, romantic, elegant. What has surprised you most during the first few months of marriage? How easy it was. Yes, marriage can be hard work, but if you’re with the right person it shouldn’t be THAT hard. The Bride and groom’s smiles are so priceless! Everyone seemed so happy and cozy! You were the first celebrant we met and from our first meeting, we knew you would help our wedding day go smoothly and hassle free. To this day, some of our guests still comment on how great our celebrant was and what a fantastic job you did. 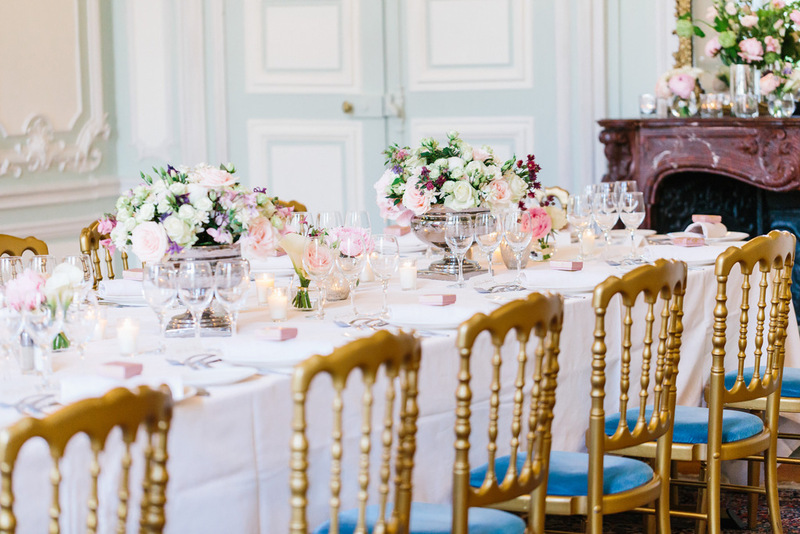 From the many weddings we have been to over the last couple of years, and even since the few we have been to since our wedding, your confidence, style and professionalism really have been well above any other celebrant we have seen.